After reaching intermediate targets, Euro started a new correction. However, the price may continue falling down quite soon. The target for the bears is the area formed by three different fibo-levels, and the line of 1.618 from fibo-channel, which was formed based on the previous ascending movement. At the H1 chart we can see, that there are five fibo-levels in the target area, which make it even more important. According to the analysis of temporary fibo-zones, the price may reach the level of 1.2650 by Wednesday. If later the pair rebounds from this level, the market may start a more serious correction. Franc is also being corrected. However, the bulls are likely to start a new ascending movement quite soon. I haven’t opened new orders yet, but plan to increase my positions as soon as the price breaks the maximum. The target area at the level of 0.9920. 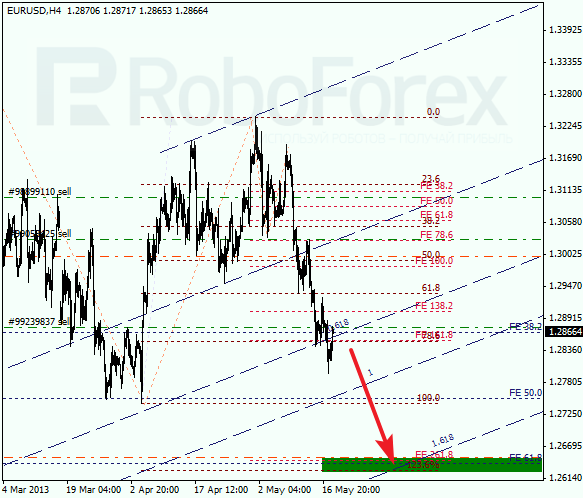 At the H1 chart we can see, that the target area is formed by four fibo-levels. As soon as the price completes a local correction, the pair may form one more backward correction. According to the analysis of temporary fibo-zones, the upper predicted levels may be reached by Wednesday of Thursday.